Vishwas is a corporate professional with a career spanning over 20 years in diverse industries. Prior to commencing with Voylla, he contributed six years in retail at Amazon.com and dedicated 15 years in the technology sector with various companies. 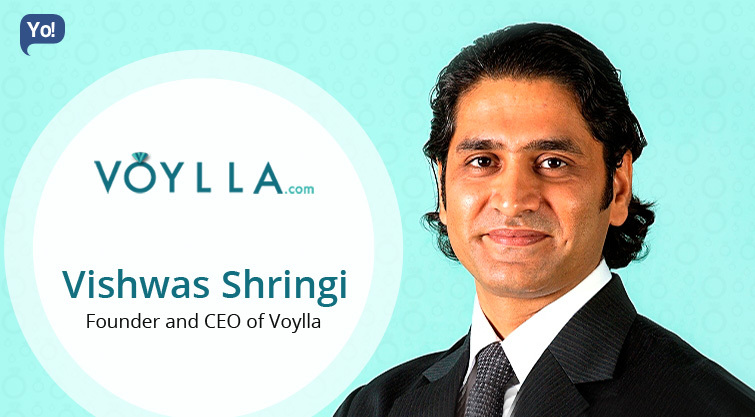 Mr. Shringi laid down the foundation of Voylla with his wife- Jagrati Shringi, Co- Founder and Chief Marketing Officer in December 2011. With his vision, competence and leadership skills, he built a successful venture out of the project, which initiated from scratch. He completed BTech from IIT-Madras and holds MS and MBAs from the US. He is known to be an enterprising person with expertise in strategy, competitive analysis, finance and business development. He aims to make his startup a one- stop gateway for everything related to online fashion in India. What inspired you to build Voylla.com? We started Voylla.com with an aim to bring designer creations within everybody’s reach; the prospect of serving worldwide audience was the main motivation behind our venture. This coupled with an opportunity to organize a highly fragmented and unorganized sector using our expertise and experience in big retail firms sealed the decision for us. The biggest challenge was an opportunity in disguise, i.e. to transform a disorganized sector to an organized one. When it comes to jewelry, people are very particular in spending and don’t trust an online portal easily. We strived hard, in the beginning, to establish the credibility in consumer’s minds by delivering high-quality jewelry at affordable prices. Our strength lies in our products coupled with great marketing and thus, we are highly optimistic about the future. Please provide a brief overview about Voylla.com. The vision of Voylla.com is to bring the best designer jewelry closer to people at affordable prices. We are bringing a change in how India shops jewelry and accessories. Our product portfolio consists of more than 10,000 products, more than 35,000 unique designs and around 500 new designs are added every week. Founded in 2012, the brand provides jewelry and fashion accessories from talented designers in India to worldwide customers at attractive prices through its omnichannel presence (offline and online both). One can have jewelry for every occasion, including traditional, modern, gemstone, chunky and fashion.As a customer centric e-retail venture, the aim is to serve customers as per their requirements, so that this platform becomes a one-stop-shop destination for all fashion and lifestyle requirements. One thing that keeps on pushing me is “never let your dreams die”. It is important to dream big and then keep on pushing our limits to ensure we are continuously on the coveted path of success, work with a focus on work and not on the result. This is the only Nirvana in this world! The company raised $15 million (About Rs. 98 crores) in funding from private equity firm, Peepul Capital in October 2015. The funds will be used for brand building, expansion of the distribution network, investments in technology and enhancement of manufacturing capacity. Previously, the company had raised Rs. 13 crores from Pune-based Snow Leopard Technology Ventures and from angel investors. Each challenge was an opportunity to learn. I focussed on the problem at hand and not on what it could do to the company. I firmly believe in the alchemist concept that the whole universe conspires to give what we truly desire. I focus on solution and long term dreams and treat challenges as small roadblocks. The Work culture at Voylla is ‘Work-Hard-Have-Fun-Create-History!’ We have an open door policy and support a flat hierarchy system. The focus is on giving more autonomy to employees and empowering them. I think three I’s are very important for success. Ist I is “I”, belief in self. Do not let anything alter your belief in yourself. Second I is “innovation”, create a unique proposition that is impossible to copy. Third “I” is “implementation”, ideas are a dime a dozen if not executed with passion. I depend on my smartphone for 24/7 connectivity with the business. My to-do list and calendar keep my life organized. I am religious about maintaining a daily to-do list and tracking it throughout the day. I’d like to be able to pull myself from work regularly to spend time with my two little boys. They are growing fast and I don’t want to miss the opportunity to witness their cute activities. Never stop believing in your dreams, come what may! One mistake you believe every individual must avoid. The dark side will play tricks to lure you. Stand firm on your ground and always seek the light. The journey will get harder with every step and you will feel like giving into various voices but keep a sharp focus on the light at the end of the tunnel. Avoid all temptations and keep on marching towards your goals. One most important lesson that you have learned till now. Voylla.com is looking to aggressively expand its presence in the offline sales space. With our flagship store in high street market of Delhi, Rajouri Market and 10 more stores coming up in next one year, we are all set to serve customers who are not currently online. We already have 9 shop-in-shop stores in India in partnership with Future Group’s Central Mall. Our mission is to have 100+ stores in next one year in high streets and malls. We plan to set up 10 exclusive stores (EBOs) across the country while the rest would consist of shop-in-shop and kiosk stores in malls. Our future channel expansion also includes the opening of physical stores in international markets covering Gulf, US, and European markets. I would start my entrepreneurial journey sooner.